innovative components from an unknown company two years ago. About the famous non circular chainrings, the idea doesn’t come from them but Rotor have the advantage to offer a custom position of the egg-shaped chainring! about keeping the traditions, would retort. transfered through the cranks to the chain, etc. Contrary to this position, when the crank arm is vertical, the lever arm is equivalent to zero and so it is not possible to transfer power. The crank arm fortunately doesn’t remain in this position: it continues its motion thanks to the inertia created by the rider’s legs, its shoes, the cranks and the pedals. (in N.m or lbs.in) depends on the lever arm (length) multiplying the strength the rider produces (in N). 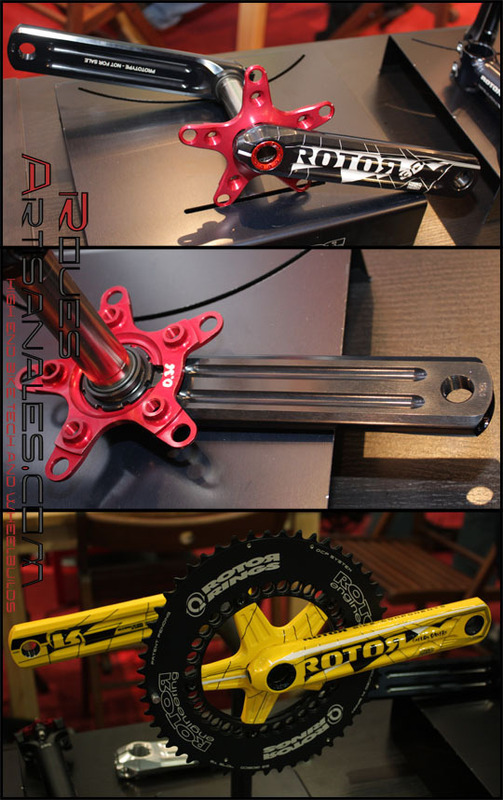 the crank arm is close to the vertical position, the dead spot has to be lowered, meaning higher rotation speeds, so the the lever arm has to be reduced: smaller chainring diameter. 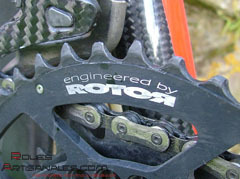 Thus, a 53 Rotor chainring corresponds to a 56 teeth chainring when the crank arm is horizontal, or a 51 in vertical position. See the drawing on the right. 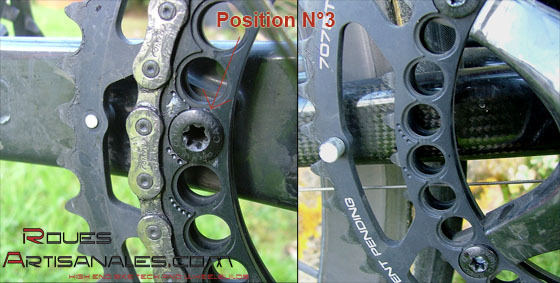 It’s possible to position the chainring to have a lot of different positions, but you can benefit from « only 5″ of them ». Some small marks indicates how you have to place the ring. According to the feelings, it is of course possible to differenciate the two rings. Mounting the chainrings is quite easy. In our case, for a Campagnolo crank arm, we had to place the mark corresponding to the position, juste behind the crank arm (i.e picture above). However the front derailleur setting was not as easy. derailleur position. If the cable were at the right length for the original position, it will be get too short… so expect a new one. indeed behave as a 56 teeth. During the biggest intensities, it « burns » more: the resting phases, created by the dead spot, seem shortened. With the time, it gets a habit. we generate when spinning the legs helps to pass it easily. Under 80 rpm, we feel like it is easier to pedal regularly. This feeling is very personnal and it will probably be different for someone else whose morphology and pedaling style is different. performance rise? From a rider point of view, it’s not possible to claim anything since there are too many factors playing a role in the performance. These figures mean a lot and would, according to the manufacturer, optimize the performance while reducing the hearth rate, so the energy spent, and while increasing the maximal power. absence of difference between round and Q-Rings. So the system definitely sounds promising, it improves the mechanics and changes the pedaling style. But from a performance point of view, the debate still is opened. The bottom bracket whose bearings « self-align ». A lot of frames, even top range frames, do not have perfectly aligned threads. 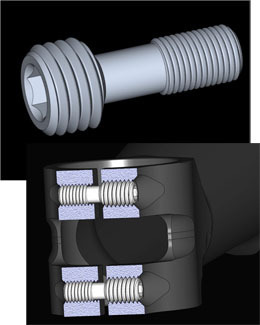 The dual thread bolt: when a half of the bolt advance of X millimeters, the other half advance of a different distance and allow the tightening.